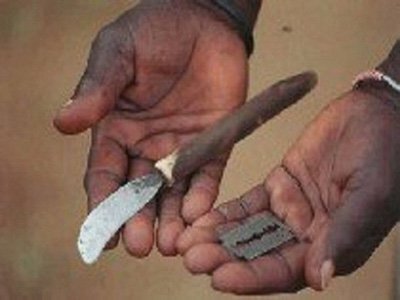 The Police Command in Kano State has arrested one Ibrahim Maikaji, the father of the girl who was circumcised by some local barbers at Sabuwar Kaura village in Doguwa Local Government Area. The Public Relations officer of the command, DSP Magaji Majiya, disclosed this while briefing newsmen shortly after presenting the suspects to newsmen in Kano on Tuesday. Majiya said the command had also arrested the three traditional barbers who forcefully held her and used sharp object to operate on her, thereby causing grievous injury to her. The News Agency of Nigeria (NAN) reports that the Emir of Kano, Alhaji Muhammadu Sanusi II, had handed over the case to the Police Commissioner, Mr Rabi’u Yusuf, after the girl was brought to the palace. “We have arrested the father who mishandled his biological daughter to local barbers for genital mutilation. “This operation was cruelly carried out and it caused grievous injury to the genital organ of the victim,” the police spokesman said. He gave the names of the three suspected barbers as Shu’aibu Wanzam, Muhammadu Garba and Aminu Ali. Majiya said all the suspects were undergoing interrogation for criminal conspiracy and causing grievous hurt, and assured that they would soon be arraigned in court for proper prosecution. He warned parents to desist from such illegal acts as anyone caught would be arrested and prosecuted.